Pumps of freedom – For the fainthearted . . .
“The petrol is sold by that company that does the good fuel.” There was a recitation of every brand until we reached the name of the most expensive. The good fuel comes at a price, but the price was less than other brands elsewhere. 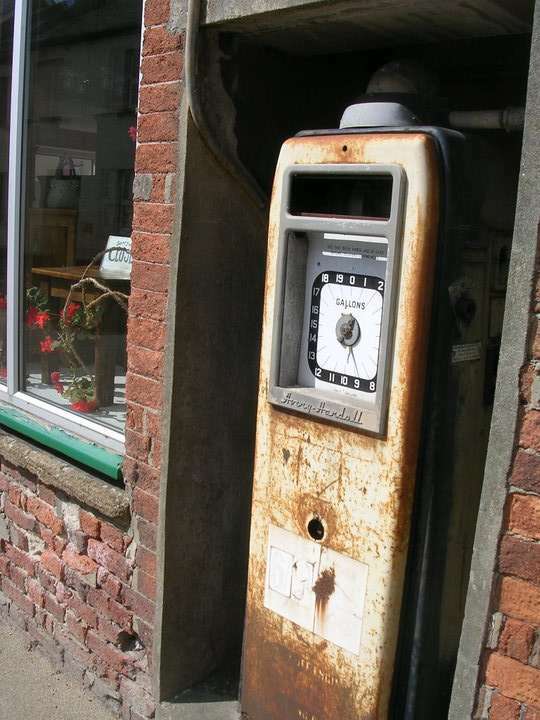 The filling station was one of those places where the pumps were incidental to the supermarket. The changes in the forecourts have meant that the number of closed garages outnumbers those still trading. 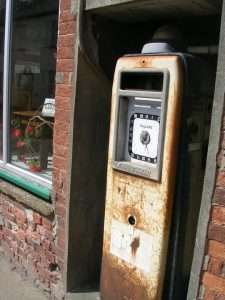 There now seems hardly a town or village in Ireland without at least one disused petrol pump, some of the old clock face mechanical variety, others of a more recent vintage. Perhaps someone somewhere has catalogued their whereabouts, perhaps there is even some pictorial record. Aren’t the former filling stations part of the industrial archaeology of the country, artefacts of a once important element of community life? The number of petrol stations in Ireland has halved in sixteen years, from more than two thousand in 1997 to barely more than a thousand in 2013. The rate of closure of the pumps in Ireland has been similar to that in Britain, where there were 37,539 filling stations in 1970 and just 8,400 in 2016. In 1960s England, it was hard to imagine that the garages would disappear. They were local institutions, they were as much part of a place as the post office and the pub. In our small village, the garage was not even on the nearest thing we had to a main road; if a driver didn’t know where the garage was, there was small chance of finding it. The garage’s sale of Fina petrol was incidental to the workshop where the mechanics performed daily wonders in keeping on the road the mistreated vehicles of ageing farmers. No sign now remains of the premises, expensive new houses having filled the land. The brands seemed more numerous then than now. Mid-Somerset was not the most populus or accessible of places, yet within a few miles of home there seemed a range of choices. Perhaps there is a conflation of memories, but Jet, Esso, Regent, Shell, BP and National Benzole come to mind. “Regent” caused a moment of doubt, but an Internet search revealed it to have been the trading name of Texaco until 1967. To a child, the fascination of the petrol stations was not the octane of the fuel or the skill of the mechanics, but the form and colour of the signs and the pumps and the buildings. The garages were places of colour and iconic designs. The unmistakeable logo of Castrol oil seemed omnipresent, though it cannot have been sold by every garage. Metal Michelin maps of Britain would be affixed to garage walls, the triangular grid of the distance calculator allowing schoolboys to work out the length of unlikely journeys. Spending each weekend from the autumn of 1977 until the summer of 1978 working single handed as the pump attendant and cashier in a rural roadside filling station was hardly exciting, but was an opportunity to meet people who might otherwise have never been encountered. The filling station, selling nothing but fuel and the odd pint of oil ceased trading in August 1978, its turnover too small to cover its running costs – one of the thirty thousand to disappear. Perhaps it is their power to evoke memories of family outings or of holiday journeys to Devon or Cornwall, but the stations seemed places with a beauty of their own, part of the growing affluence of post-war Britain, perhaps, more significantly, facilitators of the individual freedom brought us by the motor car. I think the take by the taxman from a gallion meant space was opened for big guys like Tesco to draw profit from volume sales. The little guys had no real way to make a shilling. But I think it’s more serious economically than the loss of the local pumps. Transport policy has meant the carless unemployed remain so. And while playing the US game with regard to the poor is one thing, making certain they can’t get work is another. One of my earliest memories derives for angst caused by Faisal of Saudi Arabia when the lack of petrol and my grandmother in the hospital in Cashel coincided.